Since she first entered Congress, Ilhan Omar has been under attack, and her words consistently taken out of context. The latest manufactured controversy is over remarks she made in March while speaking at an event held by the Council on American-Islamic Relations, in which she spoke about the increase in anti-Muslim bias after 9/11. “For too long we have lived with the danger of being a second-class citizen, and frankly, I’m tired of it. And every single Muslim in this country should be tired of it,” Omar said during her speech. “CAIR was founded after 9/11 because they recognized that some people did something and all of us were starting to lose access to our civil liberties.” (Omar misstated the date of CAIR’s founding, which was in 1994.) Given the well-documented rise in anti-Muslim hate crimes in the wake of that attack, and the invasive surveillance Muslim communities were and continue to be subjected to, Omar’s speech feels more like a narration of established facts than anything else. But unsurprisingly, in recent days, rightwing media, pundits, and politicians have seized on the phrase “some people did something” in yet another attempt to discredit Omar and paint her as un-American. This has led to predictable—and alarming—consequences. On Sunday night, Omar shared in a statement that since Trump’s tweet, she’s received an increase in death threats. “We are all Americans,” she wrote. “This is endangering lives. It has to stop.” The threats to Omar’s life are real—at the beginning of April, a man from New York was arrested after he called her D.C. office, saying, “Do you work for the Muslim Brotherhood? Why are you working for her, she’s a (expletive) terrorist. I’ll put a bullet in her (expletive) skull.” He later told authorities that he’s a Trump supporter and that he “hates radical Muslims in our government.” This is the kind of violence that Trump and the rightwing media ecosystem are stoking—and yet the response from Democrats to the increasing attacks on Omar has been curiously, and tellingly, uneven. And yet other Democratic leaders have been either noticeably silent or remarkably tepid in their response. Senator Chuck Schumer—who has had no qualms with swiftly issuing condemnations of remarks made by Omar that many conservatives have, in bad faith, painted as anti-Semitic—has said nothing about Trump’s words. House Speaker Nancy Pelosi’s initial response to Trump’s tweet made no mention of Omar, instead focusing on Trump’s use of 9/11 footage. “The memory of 9/11 is sacred ground, and any discussion of it must be done with reverence. The President shouldn’t use the painful images of 9/11 for a political attack,” Pelosi wrote in a tweet. On Sunday, Pelosi issued a slightly more forceful statement, yet it still did not contain a full-throated defense of Omar. Sharing that Capitol Police are “conducting a security assessment” in response to the threats Omar has been receiving, Pelosi wrote, “The President’s words weigh a ton, and his hateful & inflammatory rhetoric creates real danger.” She called on Trump to take down what she called his “disrespectful” and “dangerous” video. This is also not a surprise—Democratic leaders in Congress have done little to support Omar even as Republican officials and rightwing media outlets and pundits have made her their new punching bag. 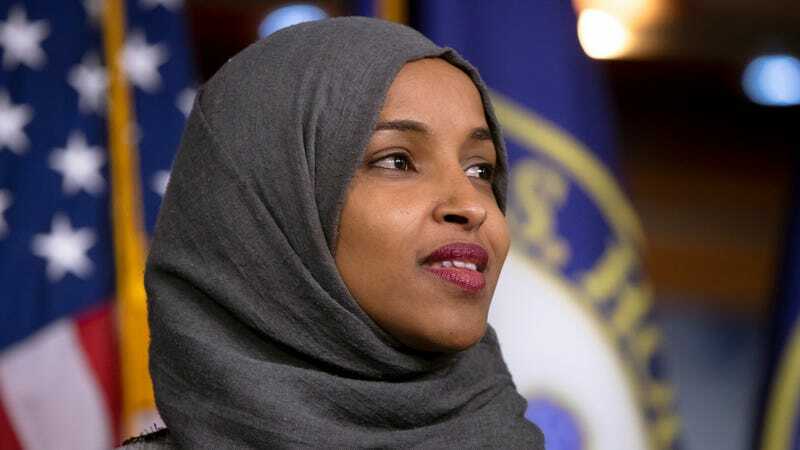 In fact, too often they have joined in, the most egregious example being the resolution condemning anti-Semitism championed by Pelosi and other House Democrats, which was a clear response to the smear against Omar. All of this in many ways feels painfully, depressingly inevitable—Omar, a black, hijab-wearing, unabashedly leftist woman, embodies everything that Trump and the Republican Party are eager to lift up as bogeymen in an effort to stoke fear and pander to their base. And it is continually dispiriting, if not surprising, to see how little most Democratic leaders will do to defend someone they should see as one of their own, but as is increasingly clear, do not.